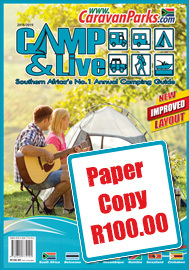 Camp & Live is Southern Africa's Most Loved Annual Caravan & Camping Guide. A very popular and comprehensive 168 page A4 guide, crammed with over 1450 resorts in South Africa, Kruger National Park, Namibia, Botswana, Zimbabwe, Mozambique, Lesotho and Swaziland. Find your way around Southern Africa with Resort and Business references on road maps! 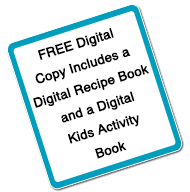 This is our best digital Guide yet! No trees need to be cut down! Once off downloadable PDF that works offline in the African bush. Certain features require Adobe Reader which is available for mobile and desktop devices. IMPORTANT: Best used on big screen smart phones, tablets and desktop devices. IMPORTANT: Works best with Adobe Reader installed. IMPORTANT: It is not recommended for use on older mobiles phones. IMPORTANT: The digital copy is a 106MB PDF download. IMPORTANT: It is recommended to use ADSL/WiFi when downloading the PDF and not a mobile network. Please take note if your download connection can support this. Please support our effort of the sustainable growth for the Caravan and Camping industry. You will receive an email with further details on how to make your payment. Once payment has been received your guide will be sent to you. 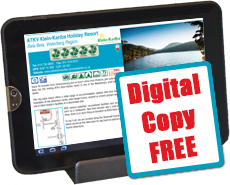 If you ordered a digital copy, you will receive an email with details on how to download your guide. If you ordered a paper copy, your guide will be posted to you and you should receive it within 14 to 21 working days. Postal Address* Make sure that you provide a postal address that the Post Office will be able to deliver to!